A Rhythmic Pilgrimage « "TeresaBruceBooks"
WWII vets are heading to Normandy for the 70th anniversary of the D-Day invasion this Friday. They’ll touch the sand, smell the salt air, revisit memories and maybe exorcise some demons. I’ve never been in combat, but I can relate to the pilgrimage part. I’m still processing my own, not to France but to Florida. 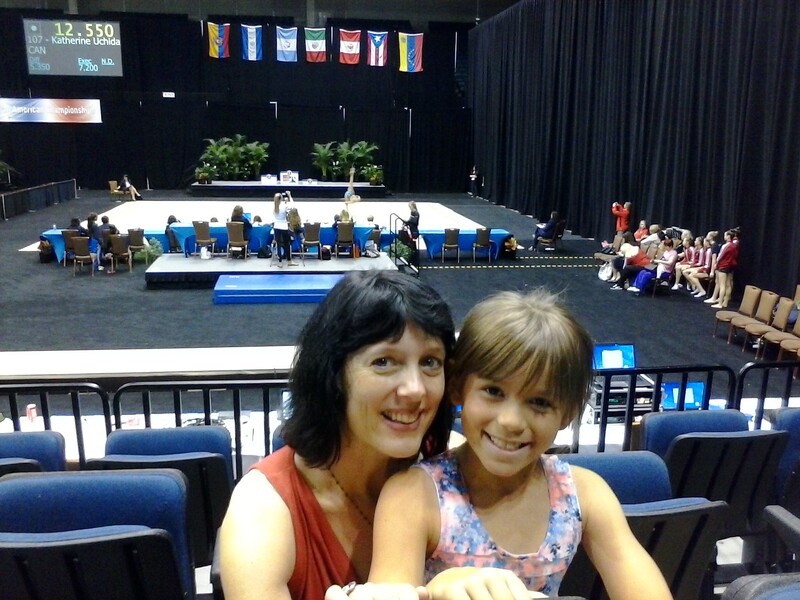 I drove five hours down Interstate 95 to take my niece to the Junior Pan Am Games of Rhythmic Gymnastics. I realize that’s not exactly crossing the English Channel but bear with me. It was the first time I’ve stepped foot in a competitive stadium since the broken back that ended my Olympic quest. I still have nightmares about forgetting my routines or being forced to compete after twenty years. A regulation carpeted floor in front of a panel of female judges is my beachhead. I’ve spoken about the training accident that both killed my career and freed me – but despite my TEDx talk I’ve never returned to the emotional injury. 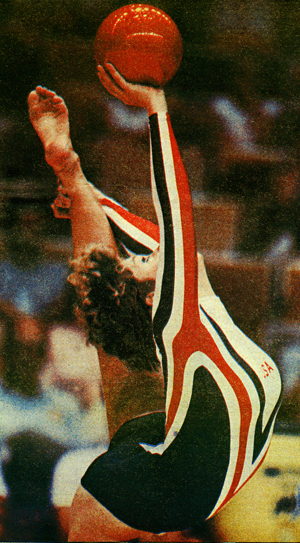 I was a freshman in college on the cusp of a dream – ranked fourth nationally and vying for a top three spot to represent my country in the 1984 Summer Olympic Games. I fell, late at night, squeezing in some extra hours before departing for a competition in Asia. I woke up, pumped full of morphine for the pain, relieved. A broken back saved me from a life of starvation dieting, 6-hour-a-day training and hoping that other gymnasts would fail so that I’d succeed.I’ve had many chances to engage in the sport since then – invitations to become a judge, choreograph, even run a gym. But I blocked it out and never looked back. Until my sister called with tickets to the Junior Pan Am Games in Daytona Beach. Her daughter Marina, the one who calls me her other mother, wanted to see the sport I almost conquered. She is eight, a gymnast too. I have introduced her to my mermaid friends at Weeki Wachee — and my cover career as a writer — but never to the reality of my childhood. Taking a seat in the almost empty stands (rhythmic gymnastics still doesn’t draw the crowds in North America that it does in Europe or Asia) was just far enough away not to smell chemical carpet cleaner, the acrid hair spray or the liquid bandage gymnasts use to glue their leotards in place. I was up high enough that the athletes themselves were like tiny dancers, twirling ribbons and tossing hoops like toys. It was a miniaturized version of my life until age 17. Watching the competition was like thumbing through a flip book of kicking legs, arching backs and juggling clubs. Marina was full of questions and I was a one-woman color commentator, explaining the differences between the ribbon and the clubs, the group routines and individual events. She was interested, but thankfully skeptical, not at all convinced it was really a sport. I watched her gasp at the unnatural contortions of flexibility and clap for the gymnasts who managed to smile even when they dropped their apparatus. I saw how intoxicating it all seems to a young girl – the sparkling costumes, the dramatic music, the stage makeup and the cheers from the audience. And I forgave myself. For caring so much and trying so hard. For defining myself by the standards of others. For thinking that making the Olympics was the single most important thing on earth and that quitting marked utter failure. When my niece snuggled into my arms I realized I could never have resisted the forces I witnessed again that evening in Daytona Beach. One small girl is powerless against the dreams of her parents and coaches. She is too desperate to please, to be perfect, to question the physical and psychological risks asked of her. I wanted to scoop up all the rail-thin girls in a giant hug of reassurance – there is life after dreams. The adventure is in the awakening. A poignant story, thank you for sharing it.